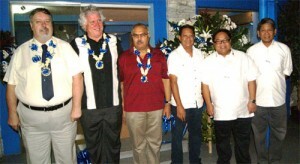 The Manila International Seafarers’ Center (MISC) Ã¢â‚¬â€œ a new Center for Seafarers in the heart of the ports of Manila, had its soft opening during the ITF-Asia/Pacific Dockers’ Conference last January 16, 2013. VIPs who cut the ribbon were Mr. Paddy Crumlin (ITF President), Mr. Mahendra Sharma (ITF Asia/Pacific Regional Secretary), Dr. Conrad Oca (AMOSUP President), Mr. Robbie Oca (AWU President) and Mr. Roy Paul (ITF Seafarers’ Trust/MPHRP) with the delegates of the dockers’ conference, the local dock workers and some Filipino seafarers as spectators. MISC is a project of the International Committee on Seafarers’ Welfare – South East Asia Regional Welfare Committee (ICSW-SEA), with the complete support of AMOSUP through Dr. Conrado F. Oca, AMOSUP President and the generosity of the Port Workers’ Union of the Philippines (PWUP) through its President, Mr. Robbie Oca. Refurbishment of the area at the AWU/PWUP Building just outside Gate 4 of the South Port in Manila, started in June of 2012 with the funding from the grant given by the ITF-Seafarers’ Trust. Part of the funding was for a transport vehicle for the seafarers which will be used in transporting seafarers from and to their ship and in taking them to other areas in Manila, such as malls, churches, parks, etc. The center will provide the basic needs of foreign seafarers while they are in the port – computers, internet connection, telephone, recreation facilities, souvenirs, etc. Mr. Paddy Crumlin, the President of the International Transport Workers’ Federation (ITF) said in his speech that “ironically, while Filipino seafarers are benefitting from seafarers’ centers around the world, foreign seafarers visiting the ports of Manila have nowhere to go. So it is very timely and vital for the MISC to be opened and start accepting seafarers.” He deeply appreciated the help of AMOSUP and AWU/PWUP in making the center into reality and in giving importance to the welfare of foreign seafarers. The dockers’ union plays a crucial role in the operation of the center as it will assist the center’s ship visitors in gaining access to the port and the ships.